IAM International President Tom Buffenbarger, right, and IAM Safety and Health Department Director Mike Flynn, left, and students at the IAM Safety and Health Conference mark the tenth anniversary of the opening of the IAM Workers’ Memorial to honor IAM members who lost their lives on the job or from work-related injuries. 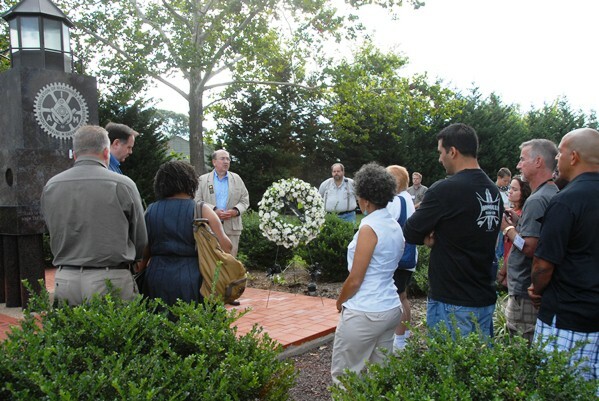 Participants at the annual Safety and Health Conference at the IAM William W. Winpisinger Education and Technology Center marked a special occasion when their class coincided with the tenth anniversary of the opening of the IAM Workers’ Memorial on the grounds of the Winpisinger Center. IAM International President Tom Buffenbarger joined the class to commemorate the anniversary with a special wreath dedicated to the memory of all IAM members who lost their lives on the job or from work-related injuries. Each year, fallen members are memorialized with bricks with their names inscribed on them. The bricks are placed around the base of the memorial. “It will be a great day when this monument ceases to grow and no more of our members and their families must suffer such great losses,” said IAM President Tom Buffenbarger. Click here for more information about the IAM Workers’ Memorial.